Guests were able to wander through almost 10,000 native trees at the first Plantout Tour site in Lincoln. With plants ranging from six-month-old seedlings to towering 15-year-old trees, it was an opportunity to see some more mature specimens. Colin Meurk – Landcare research ecologist pointed out the main species which make up the podocarp forest community including Totara, Matai and Kahikatea. Of interest was two Ribbonwood trees whose form, leaf size and shape changes as it matures. Colin was able to point out the juvenile and mature forms growing side by side. Further along Colin pointed out a five metre Totara tree that he estimated would be 15 years old. On closer inspection he found the beginnings of a tiny green berry meaning this was a female tree. He told the group that in a years’ time the berry would develop into a bright red fruit providing a nutritious food source for the birds who could then deposit seeds within two and half kilometres of the site. 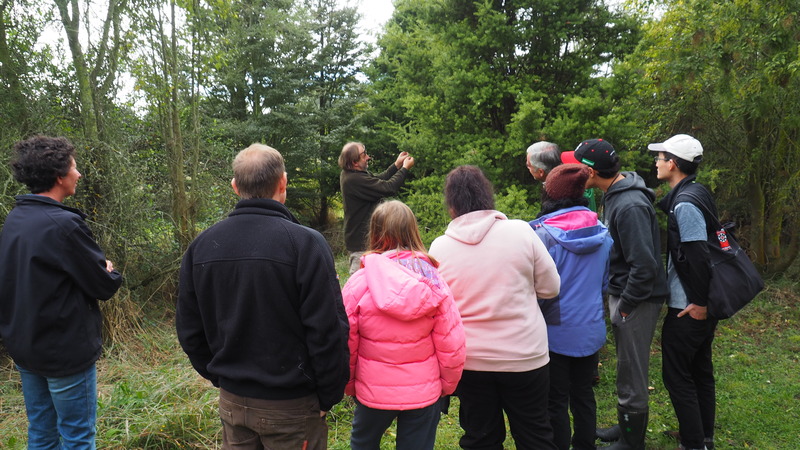 The second site of the tour was Stackwoods Bend, a Te Ara Kākāriki Kids Discovery Plantout (KDP) site along the Halswell River in Tai Tapu. Lou Drage, Te Ara Kākāriki’s KDP coordinator told guests the programme provides educational planting days with about fourteen schools each year and allows the students to be involved in the planning of the site. Stackwoods Bend is a Ladbrooks School project and students wanted a sign created to mark their work and a pathway through the middle so public could enjoy the site. “Other landowners in the area have been planting along the river also” Lou said, “maybe one day the pathway might connect to provide a nice walkway.” A typical plantout day sees the students learning about the whole ecology of a site including how their plantings can improve the health of the waterways and create habitat for invertebrate and lizard species. 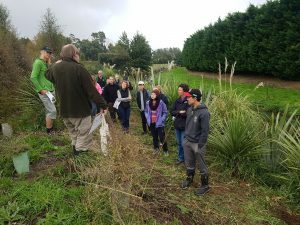 Stackwoods Bend had been crowdfunded by Million Metres streams over the past two years and last month their second fundraising campaign was completed meaning Ladbrooks School can start planning for the next two years of planting. By the end of 2020 the school will have planted 400 metres of river bank and hope to continue the project as land becomes available. Rain cleared as guests arrived in Kirwee for the afternoon Plantout Tour. As a precaution landowners Susan Hall and Kevin Dunn welcomed everyone into their barn for an introduction to their site. The couple have planted about 6,000 natives on their property since 2015 in what Colin Meurk described as an “oasis in a desert” referring to the lack of natives in the wider area. Colin showed a map of Te Ara Kākāriki greendots planted so far highlighting the progress made towards the greenway. With almost 78,000 natives planted at 73 sites, guests were interested in where the gaps might be. One landowner who is planting at his property with the trust this spring was pleased to see his site would be in an area that seemed in need of a greendot. Colin lead the group through plants up to five years old, stopping to point out some recent insect damage. A six-foot Kanuka stood out among the otherwise thriving plants as it had succumbed to suspected insect attack along with others on the property. This is not a common problem with Kanuka and so Colin and his colleagues have been working to find a solution that doesn’t involve insecticides. It was promising to see signs of self-regeneration nearby with a tiny Kanuka seedling not far from the dead tree proving how adaptable the native species can be. 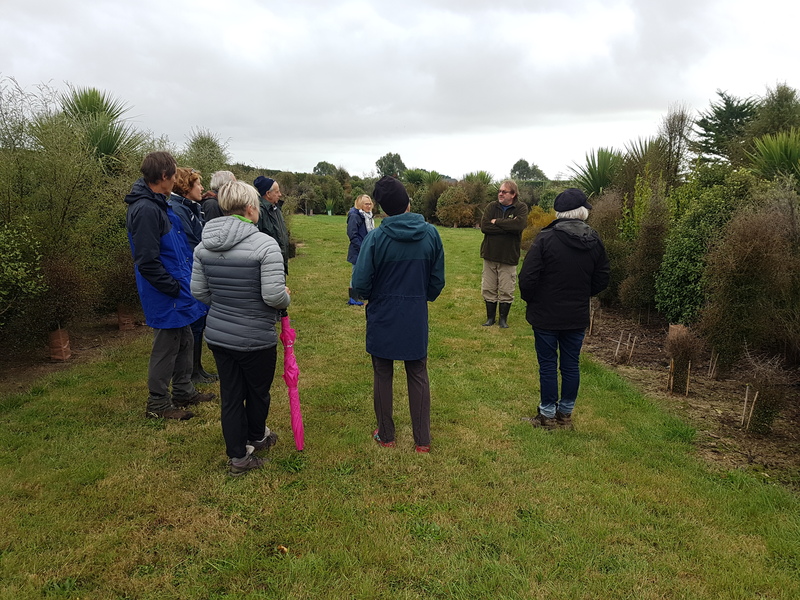 Pam Aldersley – Te Ara Kākāriki trustee spoke about how sites like this are important not only because of the plants but for the whole biodiversity of the Canterbury Plains. “We’re not only providing habitat for the much loved Tui, Bellbird and Kakariki, we’re improving the environment for invertebrates and lizards, we’re helping the climate by capturing carbon, we’re reducing runoff into the waterways and looking after our unique heritage”. The last site of the day was a Hororata wetland part of a fenced off area on Leon McKavanagh’s Dairy farm. Plantings around spring fed springs were helping provide a healthy mudfish habitat. The Canterbury Mudfish which is New Zealand’s most threatened Mudfish Species is unusual because it can survive up to three months without water. Leon told guests the waterways on his site do dry up at times and he was pleased to hear from a group monitoring the fish this year that they were still present after this. Guests were also able to see a stream side planting, planted in 2017. The plants included Carex species which are planted nearest to the water, these help to cool the stream and provide shade, protection and habitat for aquatic species.